Taking a hint from students at Drew University who put pro-gay chalk messages into their sidewalks, students nationwide will join a campaign to promote love. Messages such as "you are loved", "you are beautiful" and other positive and gay affirming messages will be written. The project encourages everyone to go out by themselves or with a group of friends and use sidewalk chalk to create positive messages. The campaign also urges people to write an op-ed for their school newspaper about gay rights and why dialogue is needed over divisive hate speech. *Please contact the project to let them know if your school will be participating. 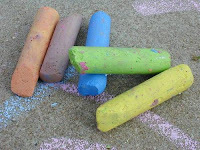 Also note that some private schools have policies against sidewalk chalk, so check with the administration first, and if you encounter problems in this peaceful demo please contact Jen at chalkmessages@gmail.com for help on how to convince them to allow it.